Designed by Rietveld together with Madame Schröder, these housing blocks have a steel frame structure, wooden floors and brick party walls. In the four dwellings on Erasmuslaan the living room may be subdivided into smaller spaces using sliding partitions. The block on Prins Hendriklaan has its bedrooms on a mezzanine shared by upper and lower units. 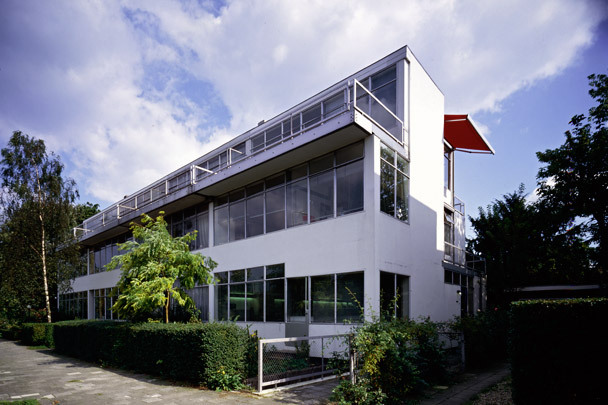 With these dwellings Rietveld seems to have become fully converted to functionalism. They have been restored, with Erasmuslaan 9 now doing duty as a museum house (visits: 030-2362310). The Schröderhuis is located at Prins Hendriklaan 50.